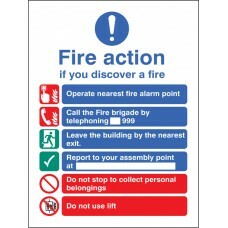 Positioning an appropriate fire safety sign at a height between 1.7m-2m from the floor helps staff and visitors locate and identify essential fire equipment in the event of it being hidden by furnishings in the room. 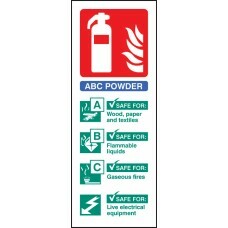 This fire extinguisher sign should be used to highlight ABC Dry Powder extinguishers. 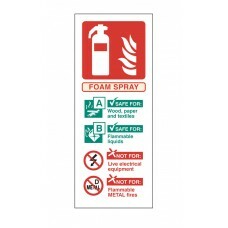 Many members of the public do not know which fire extinguishers can be used on which type of fire, that's why usin.. 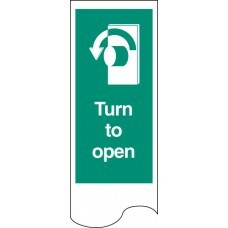 These high performance glow in the dark strips are supplied in an aluminium frame for a professional finish - helps comply to BS ISO 169 relating to the planning, design and marking for Safety Way Gui.. 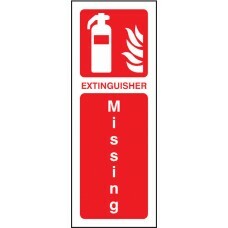 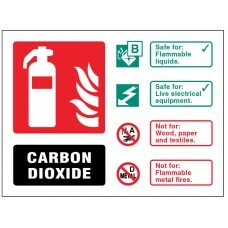 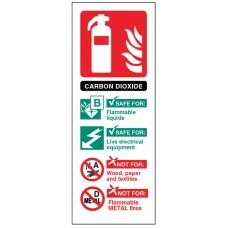 This fire extinguisher sign should be used to highlight L2 Powder fire extinguishers. 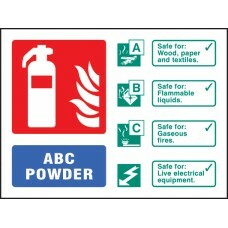 L2 Powder extinguishers can be used on wood, paper, textile and flammable liquid fires however they should not be .. 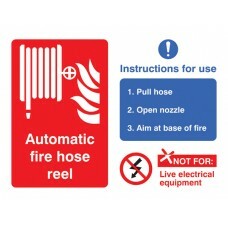 This fire safety sign not only instructs readers how to properly use a fire safety hose in an emergency, but also highlights the location of the fire safety hose. 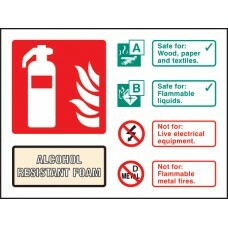 Under the Regulatory Reform - Fire Sa.. 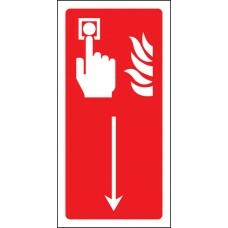 This fire safety sign enables viewers to locate a fire alarm call point quickly and easily. 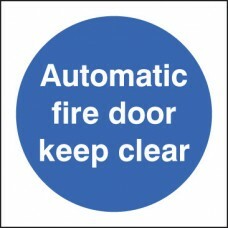 Under the Regulatory Reform - Fire Safety Order 2005 any non-automatic fire fighting equipment should be ide.. 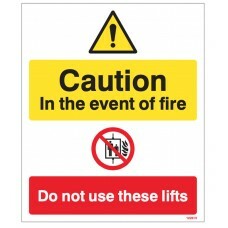 This sign warns both staff and the public of the dangers of using lifts in the event of a fire. During an emergency many people become panicked and may lose rationality. 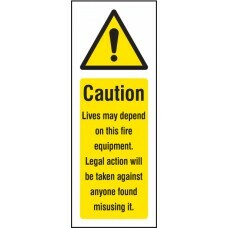 This sign reminds those people.. 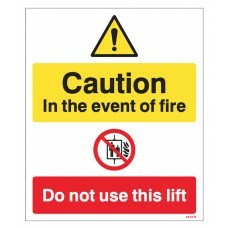 This sign warns both staff and the public of the dangers of using a lift in the event of a fire. 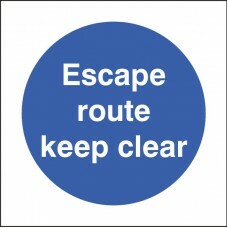 During an emergency many people become panicked and may lose rationality. 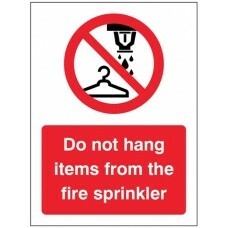 This sign reminds those peopl.. 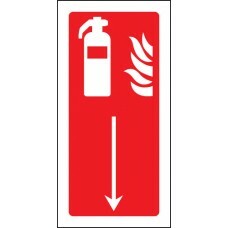 This fire safety sign is there to highlight that when an extinguisher has been removed and not replaced it can cost lives. 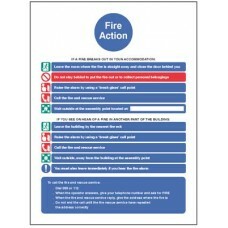 Under the Regulatory Reform - Fire Safety Order 2005 any non-automatic fire f.. 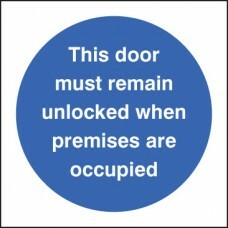 Wherever a surveillance system is being operated, a company must let people know that they are being recorded under the requirements of GDPR. 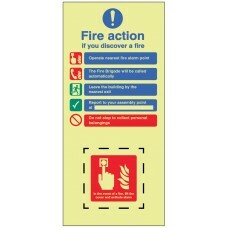 Individuals have the right to request a copy of any footag.. 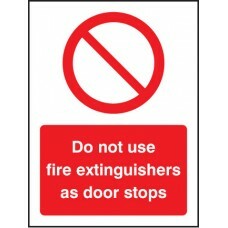 This fire safety sign warns staff that fire extinguishers should not be used as door stops. 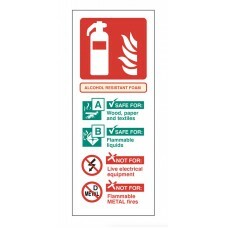 Under the Regulatory Reform - Fire Safety Order 2005 any non-automatic fire fighting equipment should be ide..
An educational Fire Safety DVD which informs staff on important fire safety training. 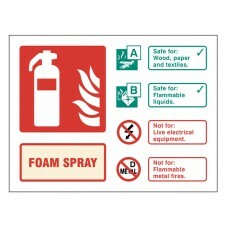 The DVD includes: Introduction to Fire Safety, Fire Prevention, Extinguishing Fires at Work, Fire Evacuation. 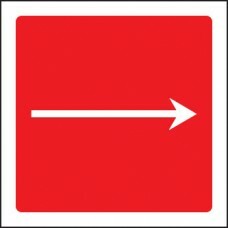 Full.. 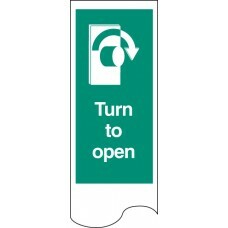 Hazard signs are displayed to advise and forewarn of potential dangers. This warning sign advises that lifting operations are in progress Material Options Explained Below is a more detailed descripti..
Keeping emergency escape routes clear from any obstruction maximises safety. 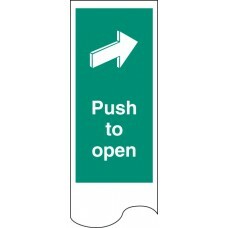 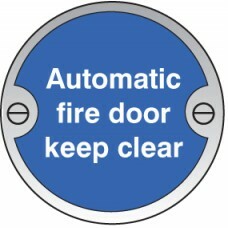 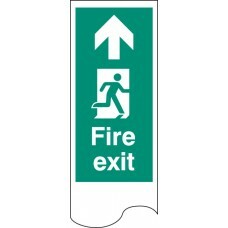 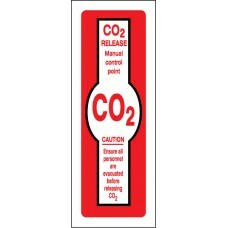 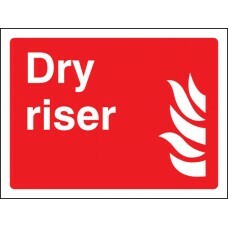 This fire door sign should be used on fire doors which could potentially be obstructed and in the event of a fire found to .. 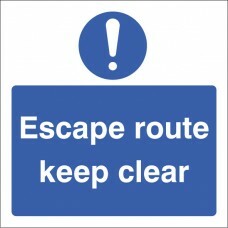 Escape Route Keep Clear ! 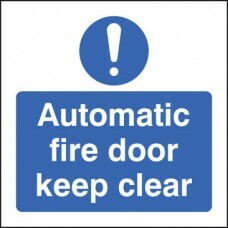 This fire safety sign is there to highlight when an extinguisher has been removed and not replaced. 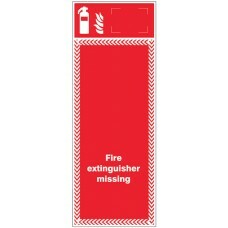 It simply fits behind the extinguisher and becomes visible when the extinguisher has been removed. 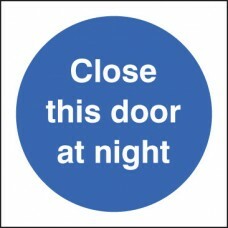 M.. 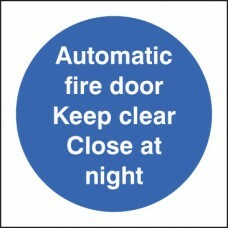 Advise residents and visitors what to do in the event of a fire within an HMO (house of multiple occupancy) property with communal areas HMOs have strict regulations for fire safety and must always ha..